Where would you be most likely to go in search of exquisite handcrafted objects or clothing? If you live in North America or Europe, your first answer probably isn’t “the nearest department store.” The idea of Bloomingdale’s or Neiman Marcus selling handwoven baskets or lathe-turned wooden plates and bowls is about as implausible as it is thrilling. But in Japan, grand urban department stores (depāto) function almost like retail-supported craft museums. Venerable stores like Isetan, Takashimaya and Mitsukoshi carry all the sorts of designer clothing, jewelry, accessories, and high-end cosmetics that you’d expect of a posh emporium. And in their basement-level food halls, you’ll find edible treasures like perfectly spherical watermelons and cantaloupes. Envelope for postcards of Mitsukoshi Department Store. Leonard A. Lauder Collection of Japanese Postcards, Museum of Fine Art, Boston. But in one key way, Japanese department stores are very different from their Western counterparts: They sell fine hand-crafted goods by contemporary Japanese artisans, and in so doing, act as the bearers of a living, breathing craft culture that thrives alongside other kinds of commerce. Why is this true of depāto, and not of Western stores like Saks Fifth Avenue or Galeries Lafayette? The answer lies in Japan’s Edo period, an era during which it was relatively isolated from the West, and during which culturally specific ideals of merchant ethics were firmly established. Department stores as we know them in the West sprang up as a natural consequence of industrialization. Their size and scale could accommodate variety and quantity, catering to the emerging European and American consumer classes at the turn of the 19th century. Scaled-up production and the proliferation of railway lines gave department stores in major urban centers access to coveted goods from near and far. In London, Paris, New York, Chicago, and Philadelphia, shoppers could find accessible luxuries such as perfume and cosmetics, hats and gloves, clothing, silver and china, sweets, and toys. The advent of in-store cafés and restaurants made visiting a place like Harrod’s, Le Bon Marché, or Marshall Field’s an entire day’s event that neatly bound together shopping, socializing. and dining in a grand public space. In the 19th century – Great Britain in the 1810s, France in the 1830s, the United States in the 1850s – department stores also offered employment and opportunities for advancement for women, which made them novel sites of both leisure and work at a moment when women’s emancipation was just taking shape in the West. Department stores were also among the preferred sauntering grounds of the flâneur, the gentleman of leisure who strolled, browsed, and enjoyed urban life as characterized first poetically by Charles Baudelaire, and later, theoretically, by Walter Benjamin. The flâneur (and later on, the flâneuse) had nowhere in particular to be, but everywhere to be seen. Advertisement for Juichiya Department Store, late Meiji era. Leonard A. Lauder Collection of Japanese Postcards, Museum of Fine Arts, Boston. Department stores as such didn’t emerge in Japan until the end of the 19th century, and while they sprang up as a direct effect of industrialization, many stores that are still operating today trace their roots back much further, to the luxury dry goods shops that catered to the country’s urban elite during the Edo Period (1603 – 1868). During this era, Japan was isolated from the outside world, yet it experienced a stretch of relative peace and prosperity under the rule of the shogunate, or military government, controlled by the Tokugawa clan. The country was still rural and feudal, but, as its coastal cities grew, it was also increasingly urban and cosmopolitan, and the limited international trade it did have with China, Korea, and the Netherlands made its merchant class rich. In the strict Confucian social hierarchy of this era, those engaged in trade ranked below artisans, farmers, and the military, so newly wealthy merchants were largely excluded from the seats of political power, which was still dominated by Japan’s hereditary nobility. But nothing prevented them from shopping, collecting, and engaging in increasingly luxurious and refined social rituals. This led to an artistic flourishing in which new art forms were born, and old customs, such as the tea ceremony, earned renewed interest as the country’s isolation inspired a reexamination of its own past. The visual legacy of activities during this period in Kyoto, Osaka, and Edo (modern Tokyo) are especially rich. Kabuki theater emerged at the turn of the 17th century. Formally designated pleasure districts, or yoshiwara, were the playgrounds of the newly-minted urban rich – possibly a deliberate attempt on the part of the shogunate to cordon these men off and distract them from the worlds of government and politics. By the end of the 17th century, the social whirl of kabuki performers, courtesans, artisans, and geisha in the yoshiwara were captured by the artists who made ukiyo-e, the block prints that captured the “floating world” of sensory pleasures for which they were named. Merchants bought ukiyo-e in droves. By the turn of the 19th century, approximately 10 percent of Japan’s population lived in cities and large towns. Each administrative district in the country was controlled by a feudal lord known as a daimyō, who would hire samurai to protect his lands. Because the estates of daimyō generally didn’t produce their own goods, they were dependent on access to the works of skilled makers, and artisans flocked to the areas surrounding their lands. Merchants, in turn, provided the conduit to regional, and occasionally international, trade. Thus the grandest of Japan’s merchant houses were like the urban equivalents of a daimyō estate. And as non-aristocratic Japanese families acquired increasingly refined tastes, the retail landscape in the cities evolved to meet their desires. Advertisement for the Mitsukoshi Dry Goods Store (Mitsukoshi gofukuten), late Meiji-Taisho era. Leonard A. Lauder Collection of Japanese Postcards, Museum of Fine Arts, Boston. One of the most robust trades was in kimonos. In 1611, Ito Genzaemon Sukemichi opened a kimono and lacquerware wholesale business called Matsuzakaya, in the city of Nagoya. His descendant Ito Gofukuten shifted the firm’s focus to silk and cotton kimonos in in the 1730s. In 1740, Matsuzakaya became the kimono fabric supplier to the Owari Tokugawa – the most senior branch of the ruling Tokugawa family. The company that’s known today as Mitsukoshi was established in 1673 as Echigoya, and likewise began as a kimono business. Takashimaya first opened in Kyoto selling gofuku, or formal kimonos, in 1831. All of these companies developed national reputations and loyal customer followings, and in one corporate form or another, each still exists today. Western powers had been vying for access to trade with Japan throughout the first half of the 19th century. Toward the end of the Tokugawa period, and following two naval incursions led by American Commodore Matthew C. Perry in 1853 and 1854, Japan’s rulers were forced to agree to trade with the United States, signing the Convention of Kanagawa. Other Western powers followed, and Japan’s political class was thrown into turmoil. The shōgun resigned, the Boshin War broke out, and a new, centralized government was established in its wake. Having been pushed into contact with the Western world in the 1850s, Japan’s new Meiji leadership set out to remake the country as a modern, industrial power. A group of feudal lords who were historic enemies of the Tokugawa family formed a pact called the Satchō Alliance and worked to support Emperor Kōmei (1831 – 1867). When Kōmei died, his son Meiji became Japan’s 122nd emperor, and his six-decade rule gave its name to Japan’s new, modern era, the Meiji Restoration. The Meiji emperor represented a totally new iteration of Japanese power. He typically dressed in military garb, like one of the crowned heads of Europe, he oversaw the establishment of Western-style government reforms, and he pushed Japan to industrialize. But this adoption of certain Western practices didn’t mean that Japan’s culture would be lost. On the contrary, Japan’s new economic and military power meant that its culture could thrive and even influence the world beyond its shores. 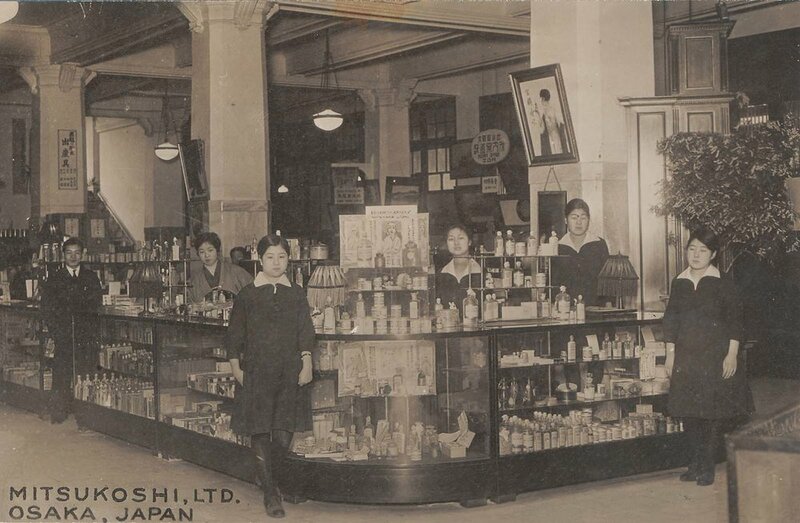 Mitsukoshi, Ltd. Osaka, Japan, late Meiji era. Leonard A. Lauder Collection of Japanese Postcards, Museum of Fine Arts, Boston. Mitsukoshi adopted the idea of “fine art” with enthusiasm, after the concept arrived from the West, according to Younjung Oh. The separate Western conceptual categories of fine art versus craft did not exist in Japan until they were imported during the Meiji period. Fine art was termed bijutsu (“beautiful technique”) and craft was translated as kôgei, a term that is still widely used to refer to fine craft in Japan today.⁷ The Tokyo School of Fine Art was founded in 1889 and the Imperial Museum the following year. Japan has relatively few public museums or galleries. To some extent, the cultural offerings of the depāto play a cultural role similar to that of a nonprofit art institution, and support the livelihoods of contemporary makers. Creighton notes that staff members in major department stores are expected to have broad cultural knowledge and to study the visual and performing arts as part of their training.¹⁵ Success for working artists and craftspeople in Japan can hinge on work being shown in a department store exhibition. In a way, department store museums are like the mirror image of the museum gift shop: you ”enter through the gift shop,“ so to speak, in order to get into an exhibition, and not the other way around. For the generations of Japanese people who have grown up in the decades since the end of World War II, in and around major cities, the presence of craft in department stores, both as cultural attraction and desired commodity, is a connection to tradition, both real and cultivated. Japan invested heavily in its craft traditions after the war, inaugurating its Preservers of Important Intangible Cultural Properties (better known as the Living National Treasure program) in 1950. Even as Japan modernized and boomed economically, it had been stripped of its military might in defeat and needed to project a new image of cultural power around the world. Crafts offered beauty, an abstract simplicity that dovetailed beautifully with postwar modernism, and a sense of connection – both real and romanticized – to Japan’s pre-industrial past. A visit to the flagship Takashimaya in Tokyo’s Nihonbashi neighborhood in the spring of 2018 suggests that the handmade and traditional are very much a going concern. On the seventh floor, a large area is devoted to the display and sale of silk kimonos. There are fitting rooms and expert staff, mostly women, waiting to help customers choose from a dizzying array of fabrics. Near the European and American china and silver, which is marketed to newlyweds just as it is in the West, there are handmade wooden serving dishes and bowls, wood-fired ceramic tea bowls, and handwoven baskets. In fact, during my visit, there was a craftsman demonstrating how he makes his baskets, right in the middle of the luxury tableware display, just as Millie Creighton described. Nearby, at the craft and hobby mecca Tokyu Hands, entire floors are dedicated to wood and woodworking tools, stationery and origami paper, fabric and sewing supplies, pens, paints, inks and brushes – so much so that the store’s motto (which sounds a little unusual translated into English), “A Creative Life Store,” makes perfect sense. Japan’s department stores both are and are not like those in the West. In Victorian-era Europe and North America, museums were civilizing destinations where middle-class families could seamlessly experience leisure and culture simultaneously. In Japan, the Meiji ideal of seeking “Civilization and Enlightenment” shaped the depāto into businesses where the Western custom of no-strings-attached browsing became a way for Japanese citizens to support, admire, and celebrate the country’s art, design, and traditional crafts in the 21st century. 1. Younjung Oh, “Art into Everyday Life: Department Stores as Purveyors of Culture in Modern Japan,” PhD dissertation, University of Southern California, May 2012, 342-343. 2. Louise Young, “Marketing the Modern: Department Stores, Consumer Culture, and the New Middle Class in Interwar Japan,” International Labor and Working-Class History, no. 55 (Spring 1999), 56; cited in Oh, 2012. 3. Brian Moeran. “The Birth of the Japanese Department Store,” in Asian Department Stores, edited by Kerrie Macpherson, 141-176. Hawaii: University of Hawaii Press, 1998, 145-146. 5. Younjung Oh, 2014. “Shopping for Art: The New Middle Class’ Art Consumption in Modern Japanese Department Stores,” Journal of Design History, 27 (4), 2014, 353. 6. Julia Sapin, “Liaisons Between Painters and Department Stores: Merchandising Art and Identity in Meiji Japan, 1868-1912,” PhD dissertation, University of Washington, 2003, 81. 7. For more on the terminology of crafts in Japan, see Yuko Kikuchi, Japanese Modernisation and Mingei Theory, Cultural Nationalism and Oriental Orientalism, London: Routledge, 2004, 237-8. 9. Kim Brandt, Kingdom of Beauty: Mingei and the Politics of Folk Art in Imperial Japan. Durham, NC: Duke University Press, 2007, 104. 10. Kikuchi, 2004, pp. 120-121. 11. Mary McLeod, Charlotte Perriand: An Art of Living, New York: Harry N. Abrams, 203. 12. Yuko Kikuchi, “Russel Wright and Japan: Bridging Japonisme and Good Design through Craft,” The Journal of Modern Craft, Volume 1, 2008, Issue 3, 357-382. 14. Millie Creighton, “Something More: Japanese Department Stores’ Marketing of a ‘Meaningful Human Life,’” in Asian Department Stores, 209.15. Ibid, 210. The organizational guru’s new Netflix series isn’t about judgment, decor, or the spectacle of mess. It’s about cultivating empathy for the things that surround us. The full episode reveals the Mersier siblings to be lovely and conscientious kids, but their enthusiasm and thoughtfulness in this moment have a guiding force: the world-renowned guru of home organization, Marie Kondo. Standing with the whole Mersier family in the kids’ bedroom, Kondo affirms the sentiment that’s at the heart of this ritual and of her “KonMari” method: “Gratitude is very important.” It’s not a concept that tends to loom large in American home- and personal-makeover shows, but its towering presence in this binge-worthy streaming series marks a welcome change of pace. Kondo achieved worldwide fame in 2014 when her first book, The Life-Changing Magic of Tidying Up: The Japanese Art of Decluttering and Organizing, was translated into English and published in the United States, where it became a New York Times best seller and sold more than 1.5 million copies. With the 2016 publication of her follow-up, Spark Joy: An Illustrated Master Class on the Art of Organizing and Tidying Up, Kondo’s books have now sold more than 11 million copies in 40 countries. Which is to say, her “life-changing magic” is well known. Many of the families who welcome Kondo into their home on Tidying Up announce when they meet her that they can’t wait for her to work wonders on their clutter. When this happens, she is quick to let them know—in the nicest possible way—that they themselves will be working the magic. If not exactly supernatural, Kondo’s effect on people is transformative, and that’s because her attitude is rooted in empathy rather than in judgment or in a prescriptive approach to outward appearances. Chatting with her interpreter, Marie Iida, on the walk from the car to the front door of her clients’ home at the beginning of each episode, Kondo finds something genuinely nice to say about every house before entering. She cuts a singular figure: Sporting a neat haircut with bangs and wearing pink lipstick, she dresses in a uniform of white tops, colorful skirts, black tights, and black ballet flats, which don’t seem to hinder her efforts even when she leaps onto a kitchen counter to tackle a tall cabinet. Kondo notices what each family cares about right away. Within minutes of arriving at the Mersiers’ home, she inquires about their love of music, pointing out all the instruments in the apartment. She then formally introduces herself to each house, and in some episodes gathers the whole family with her to silently thank the house for sheltering them, and for its cooperation as they begin their KonMari endeavor. During this ritual, Kondo’s clients are silent and hold hands, some almost tearful, visibly moved by the experience. When visiting a grieving widow in Episode 4, Kondo makes a beeline for an antique carousel horse, noting that the house seems to be full of fun. In doing so, she deftly acknowledges the thing that’s so hard for her client Margie to say: Her late husband was good-humored and whimsical, and the process of sorting through and giving away his possessions—for instance, the collection of Hawaiian shirts that anticipated a retirement full of adventure and travel—terrifies her like the prospect of a second death. Seeing Kondo’s joy at hopping on the horse (which she’s only permitted to do because she’s 4 foot 8), Margie visibly relaxes. Barely saying a word, Kondo communicates to her client that it’s okay to keep enjoying things while making way for a new future. In the introduction to each episode, Kondo states her mission: to “spark joy in the world through cleaning.” Her method is deceptively simple. She has clients begin with clothing, move on to books, then paper documents, then komono, which means “miscellaneous” in Japanese and encompasses the kitchen, bathroom, garage, and other objects. Then they finish up with the final category, which is sentimental items. There’s something about the way in which Kondo explains the goals of her exercises that gets her clients to open up. This is the key difference between Tidying Up and most other reality shows: There’s no sense of competition, and the ostensible makeover at the heart of every episode simply involves regular people becoming happier and more at ease in their own home. Kondo doesn’t scold, shame, or criticize. Things spark joy or they don’t, and it’s fine either way. The families whom Kondo visits—all of whom live in the Los Angeles area—range from newlyweds and the parents of toddlers to empty nesters and retirees. They hail from an array of ethnic backgrounds; some are well heeled and others live modestly, but none are full-on hoarders, nor are any of them extremely rich or desperately poor. Kondo isn’t dealing with people who appear to need serious psychiatric help or whose homes are legitimately unsafe or unsanitary—a key difference between this show and the popular A&E series Hoarders, which aired from 2009 to 2013. Tidying Up also doesn’t address the topic of generational trauma and the way it can shape people’s relationships with their possessions, which Arielle Bernstein wrote about for The Atlantic in 2016. Kondo’s clients are merely (sometimes profoundly) stuck: Short on time or long in denial, they’re either frazzled parents trapped in a Sisyphean rut with laundry or older folks overwhelmed by decades’ worth of clutter. The genius of Kondo’s approach is that she cares not at all about renovation or decor. Her clients’ homes might be stylish or drab, spacious or cramped, but she treats them all the same: Every newly tidied room gets the same gasp of delight that signals Kondo’s pride in the family’s accomplishments. The host never suggests adding an accent wall or some trendy shiplap to spruce things up. Instead, she shares her clients’ joy at finding space and reconnecting with meaningful heirlooms. In Episode 2, in which Kondo helps Wendy and Ron Akiyama sift through mountains of vintage baseball cards, Christmas decorations, and clothes, the couple unearth Ron’s father’s diary, which includes an entry from the day of the attack on Pearl Harbor and chronicles the family’s experience at an internment camp during World War II. In the garage, the couple finds a huge collection of beautiful antique kokeshi dolls, which are turned on a lathe and brightly painted, and which Wendy didn’t even realize they owned. Now in the cleared-out garage, the dolls have a place of honor, and a tangible piece of the Akiyama family’s history can be enjoyed. Though she never comes out and says it, Kondo clearly believes that most people have way too much stuff. In this way, her ethos resembles that of the legendary industrial designer Dieter Rams, who is the subject of a new documentary by the Helvetica director Gary Hustwit. Rams doesn’t mince words about the threat consumerism poses to our planet: “The world 10 years from now will be a completely different place,” he says in the film’s trailer. “There is no future with so many redundant things.” The jam-packed closets, garages, and cabinets of Kondo’s clients perfectly illustrate Rams’s point: Americans’ collective denial about cheap goods, impulse purchases, and thoughtless accumulation is literally choking our homes and our world. That’s why Kondo begins by instructing her clients to put all of their clothes on the bed. When confronted with the enormity of the pile, they’re shocked, and then they become motivated to make careful decisions about what they really want to keep and what they can part with. Feeding that internal motivation, rather than offering direct instruction, seems to work. In Episode 8, “When Two (Messes) Become One,” Kondo is working with a newlywed couple who just bought a condo, and one spouse, Alishia, finds herself at an impasse with a dress her late grandmother bought for her years ago. While sorting her clothing, Alishia notes that the dress no longer fits, but she’s torn because it connects her to a happy memory. Somehow, she feels that she should part with it. Kondo then throws Alishia a curveball: “The point of this process,” Kondo says through her interpreter, “isn’t to force yourself to eliminate things; it’s really to confirm how you feel about each and every item that you possess.” In other words, You do you. With the pressure eased, Alishia feels ready to say goodbye to the dress, which someone else will now be able to enjoy, knowing that she has room for other keepsakes to remind her of her grandmother—and a well-organized closet of clothes that fit. The other essential point that pervades Tidying Up but mostly goes unarticulated is that home organization is historically women’s work. In many of the families featured on the series, the moms are the ones shown leading the charge to clean. Still, Kondo’s approach short-circuits this dynamic somewhat not by pointing out the gender disparity (the word feminism is never uttered), but rather by insisting that every member of the family take responsibility for their own stuff. Nolan Mersier, the preternaturally wise tween from Episode 3, sums it up this way: “I want to learn where I should put things, but at the same time, I kind of like my mom having to know where everything is, because I don’t have to think about it as much.” It’s as good a summary of “worry work” as any. Kondo’s strategy isn’t explicitly tied to correcting gender imbalances, but this can be a beneficial outcome of a process that prompts clients to find empathy in unexpected places. The host worked as a shrine maiden in Japan during college, and there are elements of the KonMari technique that borrow from Shinto beliefs, specifically the notion that inanimate objects are bearers of kami, or divine essence—in the same way that plants, animals, and people are. That’s why Kondo taps piles of old books to “wake them up,” folds clothes so that they can rest more comfortably, and asks her clients to thank pieces of clothing for their service before setting them aside. Paradoxically, the exercise of cultivating empathy for the things that surround us, rather than encouraging materialism, seems to lead Kondo’s clients to also have empathy for one another, and for themselves. Sixty years ago, Stan Freberg’s satirical song “Green Christmas” angered advertisers for partaking in an age-old American tradition: criticizing the commercialism of the season. Starting around Thanksgiving, one can hardly run an errand or ride an elevator without being serenaded by Christmas music. The songs cover familiar seasonal territory—silver bells, open sleighs, roasting chestnuts—as well as a timeless emotion: desire. Just think of Eartha Kitt flirting with “Santa Baby,” Mariah Carey donning a Santa hat to sing “All I Want for Christmas Is You,” or George Michael pining for a lost love in “Last Christmas,” by Wham! But all of those romantic lyrics about wanting and wishing also happen to tap into a different, but no less powerful desire: the urge to shop. Which is one reason there’s a holiday classic that those racing to finish their gift shopping won’t hear this year: “Green Christmas,” by Stan Freberg. When it was released by Capitol Records 60 years ago, the song caused a huge backlash from major advertisers, many of whom threatened to pull radio ads in protest. A young DJ at the time—one George Carlin—was almost fired for playing it on the air. “Green Christmas” (originally styled “Green Chri$tma$”) can best be described as a holiday choral jazz parody inspired by the narrative of Charles Dickens’s A Christmas Carol. Updated from 1840s England to 1950s America, the 1958 track is set in an advertising agency where the company chairman is named Mr. Scrooge, and a client named Bob Cratchit wants to devise a purely humanitarian holiday message for his small spice company. As in a Broadway musical, the dialogue in “Green Christmas” is frequently interrupted by people bursting into song. When the chorus sings “Deck the Halls With Advertising,” an announcer promoting the fictional Tiny Tim Chestnuts intones, “Tiny Tim’s roast hot like a chestnut ought!” echoing the famous slogan “Winston tastes good like a cigarette should.” Mr. Scrooge laments that Christmas comes but once a year, adding that it’s incumbent upon businesses to seize the shopping season. Cratchit tells Scrooge that “people keep hoping you’ll remember” whose birthday Christmas celebrates, but no one listens. The song closes with a chorus of “Jingle Bells” highlighted with the sound of a ringing cash register. Cratchit’s disappointment echoes that of his namesake in A Christmas Carol, but instead of worrying for his own family, this Cratchit is concerned about the disdain with which Scrooge and his company seem to treat the buying public—which is to say, everyone. And unlike Dickens’s Scrooge, this one experiences no Christmas awakening. When the song was first released, Freberg was told by a Capitol executive that he’d never work in advertising again. The record was lambasted in advertising trade magazines, and caused advertisers to demand that their segments be played with a buffer of at least 15 minutes from the song. A station manager at KCBS-TV in Los Angeles described “Green Christmas”—apparently without irony—as “sacrilegious.” But Freberg wrote in his 1988 autobiography, It Only Hurts When I Laugh, that despite the attempts to limit the exposure of “Green Christmas,” he got loads of fan mail about the record, much of which came from members of the clergy who admired its message. About six months after the song’s release, Coca-Cola and Marlboro both approached Freberg to work on satirical ads, and though he rejected Marlboro, he ended up worked with Coca-Cola on a successful campaign. Despite (or perhaps because) of the controversy, Freberg’s career as an adman spanned decades. The ruthlessly commodified landscape that Freberg warned about hasn’t gone away. If anything, it has only grown more insidious: Social media, smart devices, and native-ad content have made Christmas commerce impossible to avoid. The low-key, conversational tone of much contemporary advertising allows it to fade seamlessly into the background noise of daily life. The Mr. Scrooge of “Green Christmas” would be positively giddy at the idea of digital beacons that track your movements via your smartphone, then creepily show you online ads for the very thing you just shopped for in real life. And the fact that you tend to hear cheery Christmas songs while shopping is not an accident: Retail “soundtracks” have been a fixture of the holiday season in America since Muzak went mainstream in the 1950s. But retailers also understand that there’s a fine line between setting a festive tone in stores and driving shoppers crazy. Over and above sheer auditory annoyance, the tension between loving and loathing holiday tunes is just one facet of a long-standing ambivalence about Christmas and consumerism. One vein of Christmas commentary holds that the holiday has become much more businesslike than it used to be. However one might feel about the ways in which the holiday today differs from that of a fondly remembered childhood, modern Christmas itself is as old as Americans’ anxieties about its alleged commercialization. The way Christmas is now celebrated, with its twin focus on retail and childhood, is a cultural tradition that dates back less than 200 years. Even the way one imagines Santa’s workshop, which is superficially rustic but conceptually modern, contains a subtle critique of 19th-century capitalism. One classic depiction comes from an 1866 Harper’s Weekly illustration by Thomas Nast called Santa Claus and His Works, which shows Saint Nick sewing clothing for dolls, finishing wooden toys by hand, and consulting a hefty Record of Behavior—presumably to prepare for the big December 24 toy run. Santa’s portrayal here is like the Christmas equivalent of a Craftsman-style bungalow, or a 19th-century Gothic Revival building: It employs the imagery of a romanticized medieval past to disguise the guts of a rapidly industrializing consumer culture. “The stockings were hung by the chimney with care, and concentric circles of light and shadow danced in a modernist tableau, all over the ceiling.” Wait, what? If you’re accustomed to old-fashioned fragrant evergreen trees, sticky with sap and heavily laden with ornaments and string lights, the spare glow and futuristic lines of the modern Christmas tree will knock your proverbial stockings off. The first thing you might notice about these trees is that they look “Modern” with a capital M—as in postwar, midcentury design. Yet they’re not vintage, and they weren’t manufactured until fairly recently. While these novel trees were designed by engineer and builder Lawrence Stoecker in the 1960s, they were not produced until Stoecker’s grandson Matt Bliss launched The Modern Christmas Tree in 2011. In the mid-1950s, when Walt Disney’s long-planned, eponymous California theme park was taking shape, he found himself butting heads with a member of the his construction crew. “One of the contractors on the job tried to substitute plastic for wrought iron, and Walt insisted on authenticity,” says Chris Nichols, whose new book Walt Disney’s Disneyland (Taschen, $60) lavishly illustrates the creative process of the park’s creation, from drawing board to ribbon-cutting. “Imagineer John Hench said that if the design elements were not authentic, guests would have a harder time suspending disbelief and placing themselves in the story,” Nichols tells AD PRO. That, in a nutshell, is what sets Disneyland apart from the scores of other amusement parks, fairs, and attractions that both presaged and followed its 1955 debut: No other park of its kind was designed with so much emphasis on the idea of transporting visitors, both physically and narratively, into another world, as though a teacup ride might actually sweep one down the rabbit hole and into Wonderland. What does it mean to be American? How do we look? What does it mean to look as though we belong? Nearly every endeavor Stephanie Syjuco undertakes is motivated by a question, and depends on the viewer to provide part of the answer, or to ask a question of themselves. Her work questions everything from notions of identity, to broader cultural and economic concerns, such as, what is the value of labor? Why are logos important to consumers? What makes an object counterfeit? She is fascinated by systems, so her work usually involves multiples in various forms, from off-the-rack clothing to crocheted knock-offs of luxury accessories and ersatz pieces of currency. Her projects tend to capture the friction that occurs where a standardized entity meets an individual (or many millions of individuals). Every person who views or interacts with one of Syjuco’s projects will experience it differently, depending on their own role in the larger global networks of fashion, consumerism, money, and labor. Running through each of her projects is an emphasis on context, and how we see things differently when the backdrop changes. The term “design fair” may call to mind a particular mise-en-scène: a constellation of temporary gallery displays full of limited-edition works by boldface-name designers, glossy catalogs, perhaps a few celebrity sightings, and the clink of Champagne glasses at an invitation-only vernissage. That may do for New York and Miami, but in the City of Brotherly Love, each October, the design festival belongs to the entire city: DesignPhiladelphia, organized by the Center for Architecture and Design, which this year packed more than 120 events into 11 days running October 3–13. Its programming emphasizes innovation, business-civic partnerships, and adaptive reuse. This year's theme, “Design Purpose,” sought to showcase emerging designers who are thinking globally and prototyping their ideas locally. Now in its 14th year, DesignPhiladelphia hit a new level of chic this season with dazzling light installations by Klip Collective, a keynote talk by graphic design legend Paula Scher of Pentagram, and tours of the city’s many distinct design- and antiques-rich neighborhoods. In the heart of Philadelphia’s Callowhill neighborhood, on the fourth floor of a former industrial building that overlooks the new Rail Park, a world of treasures awaits. Down a hallway lined with smart Harvey Probber chairs upholstered in a fabric from David Adjaye for Knoll Textiles, the light-filled offices of design firm Fisher Grey (fishergrey.com) look move-in ready. Partners Joshua Thibault and Gregg Krantz relocated to this spacious loft about 18 months ago. Jaws dropped in February, 2018 when the official portraits of former President and First Lady Barack and Michelle Obama were unveiled at the National Portrait Gallery in Washington, DC. The Obamas’ selection of the artists Kehinde Wiley and Amy Sherald represented a number of firsts: the painters were the first African- Americans commissioned to create official presidential portraits, and the first to take a non-traditional aesthetic approach to the task. (Most official presidential portraits are sober, realistic likenesses with few artistic flourishes.) But there was another “first” about the Obama paintings when they were first revealed, unfolding on cable news and online: people all over the world were talking about the meaning of portraiture. Observers lavished praise on the paintings and singled them out for criticism, adopted them as lock screen images on their smartphones, photoshopped themselves into the graphic gown that Michelle wears in her painting, or into the lush field of greenery that surrounds Barack in his. Were they “accurate”? Were they dignified? Did they reflect appropriately the office? Did they send the right message? It’s hard to remember when an official portrait triggered this kind of conversation in the artworld, much less on Twitter. Round about January 2016, we became very interested in the colour pink. And we weren’t alone: the streets were full of pink pussyhats, placards, and other forms of protest gear, all mobilised in response to Donald Trump’s inauguration. This politicisation was all the more striking because a particularly inoffensive version of the hue – originally marketed as rose gold, but now universally known as “millennial pink” – had dominated recent fashion cycles. As design historians, we were fascinated by how the colour could take on drastically different meanings, all of which were nonetheless totally legible to the general public. So, we looked into it. Visit the American Craft Council’s digital collection of Craft Horizons, peruse them in chronological order, and you’ll find that the design trajectory across its four decades in print is immediately apparent. Start with the first few issues, which were published during World War II and look like bulletins from a government agency or humanitarian organization. Soon, photography is introduced – but only in black and white, and the covers retain their austere, imposing logo, a stylized eagle with its wings spread wide. Scroll a bit further into the late 1940s, and suddenly Renaissance paintings and Mughal miniatures bloom in full color. Then, in the spring of 1950, something very different appears for the first time on the cover: abstraction. A red, white, and black stencil by the Spanish avant-garde painter Joan Miró. It has all the curves and swagger of a piece of studio jewelry by Art Smith; a Renaissance painting it was not. When artists are gone, we usually have two ways of getting to know them visually: through their work, and through photographs or film documenting them or their studio. Alice Kagawa Parrott, a fiber artist, ceramist, and ACC Fellow, died in 2009, at 80. Though there is something irksome about accomplished artists – particularly women artist who were active in the middle of the 20th century – being “rediscovered” by style-seekers on the internet, Parrott’s work is indeed enjoying a well-deserved resurgence of interest, with articles appearing in the past several years on the Gravel & Gold collective’s blog and Esoteric Survey. Her color sense and the pastoral beauty of her home and studio are enormously appealing and feel quite contemporary: She clearly loved magenta, and her indoor-outdoor workspace looks chic, unpretentious, and dreamlike. Her work was recently featured in the Museum of Arts and Design’s 2015 exhibition “Pathmakers: Women in Art, Craft and Design, Midcentury and Today.” Yet even in the studio craft world, Parrott’s name is less recognizable than that of Sheila Hicks, Lenore Tawney, Ruth Asawa, or Toshiko Takaezu, her friend from Cranbrook in the early 1950s. Jeans are a kind of uniform and a category of clothing unto themselves. In a pinch, they offer a face-saving way to punt the bottom half of an ensemble, acting as an always-cool stand-in for something more well thought through. Titans of Silicon Valley regularly turn up in jeans to give talks and make major new product announcements. Jeans are different from pants as a broad category because they mean something distinctive, much in the way that high heels are a category apart from shoes. In her 1963 manifesto of emergent feminism, The Feminine Mystique, Betty Friedan identifies the middle class housewife as the “chief customer” of American business, and theorized that it was women’s unmet need for intellectual stimulation, not avarice or keeping-up-with-the- Joneses, that was driving their eager consumerism. She dismisses domestic labor as a non-occupation, a routine of make-work that diverts women from meaningful engagement with the world. Friedan’s point of view assumes that the care of home and family exists in a kind of bizarro world of non-professional work, in which women’s intellect was all but wasted. Since the morning of Sunday, January 21, design Instagram has been awash in images of sinuous objects that defy easy categorization. A silver chair looks as though it could be the tongue of a colossal human figure; a massive white seat resembles nothing so much as a gigantic, gleaming back tooth. Candy-colored neon lamps sit on bases that resemble sturdy elephant’s feet. In some of these images, a slight, silver-haired, bespectacled man looks at the camera, seated on a wild creation with three legs, or at the edge of a sculptural object comprised of curvaceous cones and scoops. Happily reclined, as though he had made himself at home in a craggy, natural rock formation that was never meant for human comfort, Wendell Castle often had the look of a friendly genius who didn’t quite know what all the fuss was about. Stuffed animals beckon to us constantly: from retail kiosks, amusement park prize shelves, and toy stores, eventually finding their “forever homes” in countless childhood bedrooms around the world. They elicit deep sentimental attachment, and even love. Unlike pets, there is theoretically no limit to their lifespans. With us from the first moments of our lives through the scrapes and dramas of youth, they are witness to every secret embarrassment, comfort us through every lonely worry. One of the most famous narratives involving a stuffed toy, the story of The Velveteen Rabbit, is so poignant that it can move adults to tears. Cloaked in fake fur, stuffed animals carry real emotional heft, and occupy a singular place in the history of play. But we don’t usually live with them forever. Because stuffed toys are associated primarily with childhood, their presence in other walks of life—like contemporary art—jolts us with conflicting impressions of something very innocent paired with something much more grown-up. This may be because, like fairy tales, stuffed animals’ own history is surprisingly dark. Face jugs crafted in the mid-nineteenth century by slaves and freedmen working in the Edgefield District of South Carolina are among the rarest and most historically significant of American folk art ceramics. The Metropolitan Museum of Art in New York recently acquired a superb one. Situated on a busy industrial corridor of Philadelphia’s Frankford neighborhood, Amuneal’s 60,000-square-foot fabrication space looks every bit an artisanal design mecca. Furniture and shelving are meticulously crafted from metal and wood every square inch of which has been treated by hand to achieve just the right surface texture and color. Finished pieces are packed with installation instructions and diagrams that are almost works of art in their own right. This catalog from Archie Bray Foundation features writing on five different Bray fellows of contemporary ceramic arts. Each year the Bray invites a writer into their realm to survey their rich creative community, spend time with the artists, and create a body of writing guided by their experience. Their 2017 writer-in-residence is Sarah Archer. All of the writing in this catalog was produced by Archer. This year’s fellows include Ling Chun, Nicholas Danielson, En Iwamura, MyungJin Kim, and Noah Riedel.